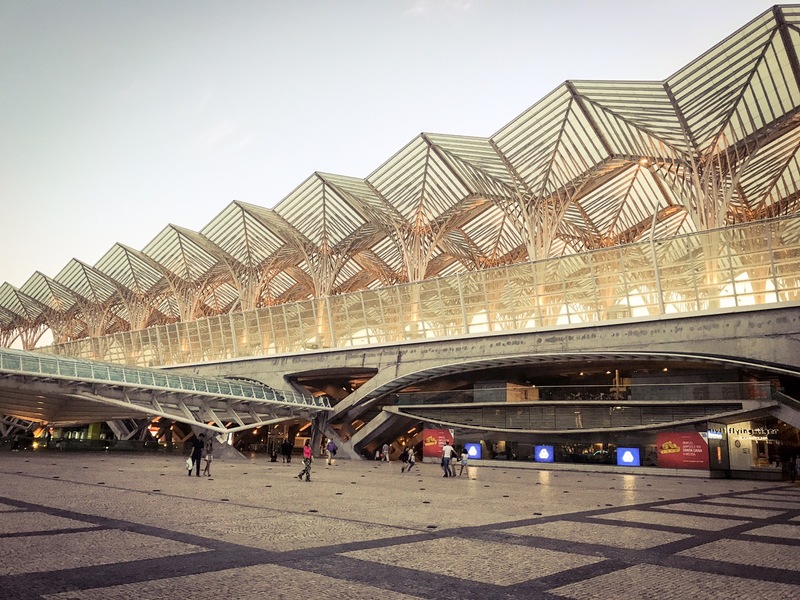 Packing took a little longer than expected, so Mikey literally had to run through the train station in Porto and jumped onboard with 20 seconds to spare! Surprisingly though, the trip was very pleasant and we flew south at speeds in excess of 220kph/135mph – basically as fast as Mikey ran to the train. 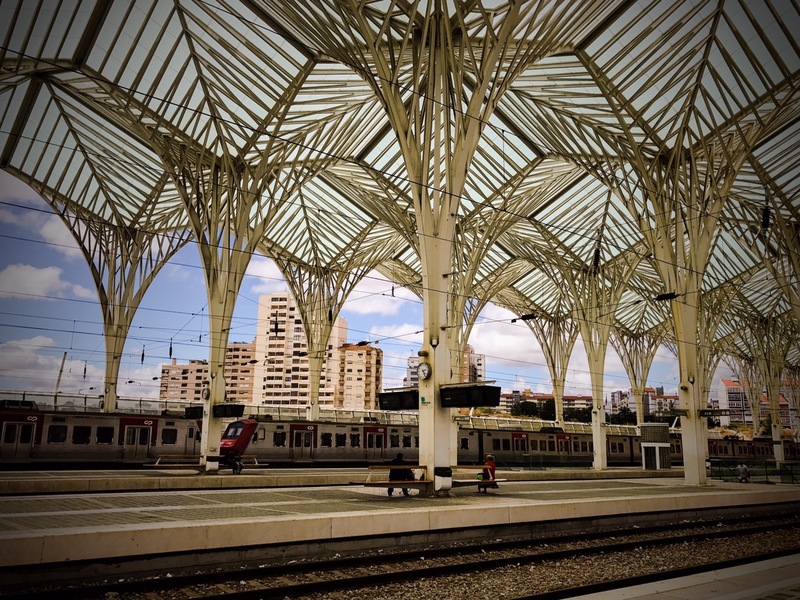 In less than 2 1/2 hours, we arrived at the Orient Station in Lisboa. It looked pretty cool, so Mikey snapped a quick picture. Still, what he wasn’t ready for was the heat. Porto had been a pleasant 18*C (65*F) whilst the 30*C (86*F) was noticeably warmer considering some newly acquired baggage weight. 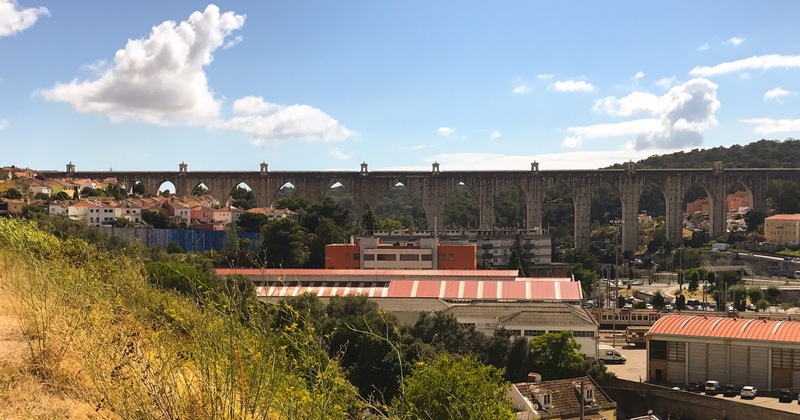 After settling in at the guesthouse (it’s an apartment where we have a room and private bathroom, but there are shared kitchen, dining, and living areas), we headed out to see the city’s 18th century aqueduct. I’m sure it was an impressive architectural feat, but this is about as close as we got before heading towards the downtown and its cooling ocean breezes. 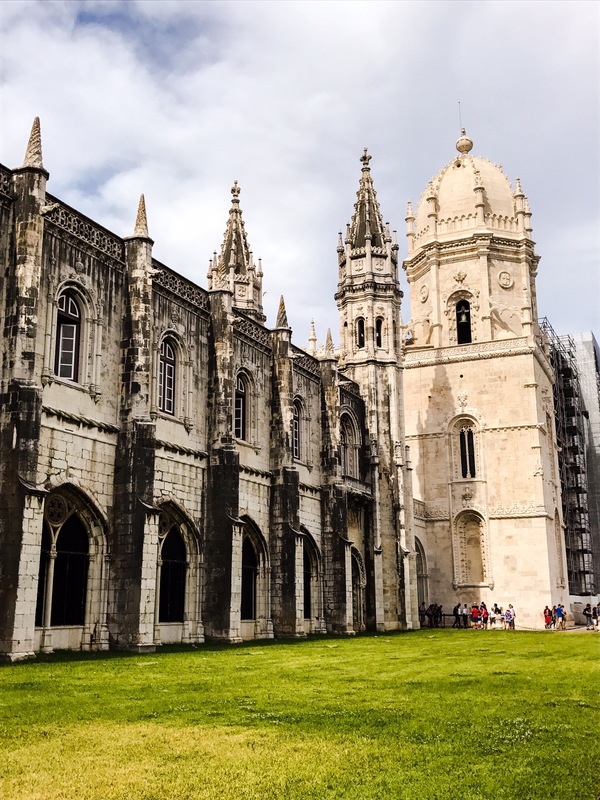 Like many capitals, Lisboa is a city of monuments. 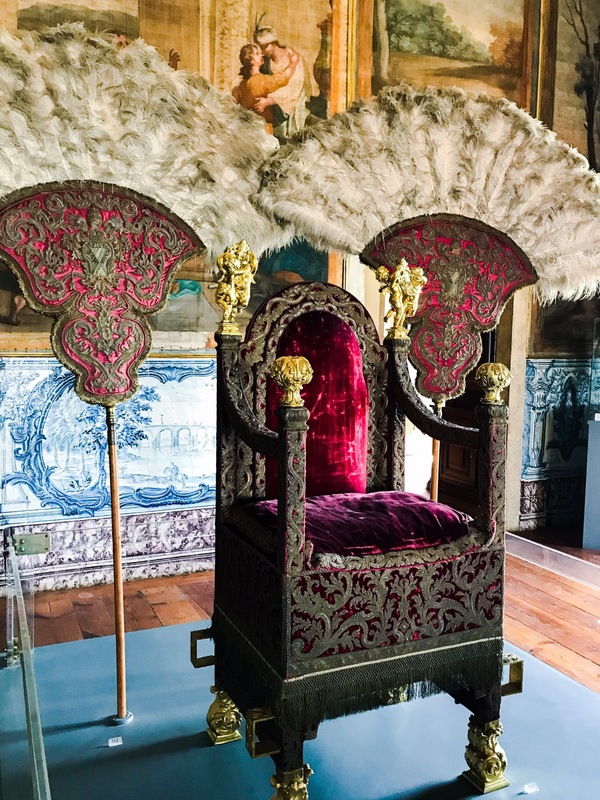 Unfortunately, Mikey’s Portuguese history has been failing him repeatedly on this trip. 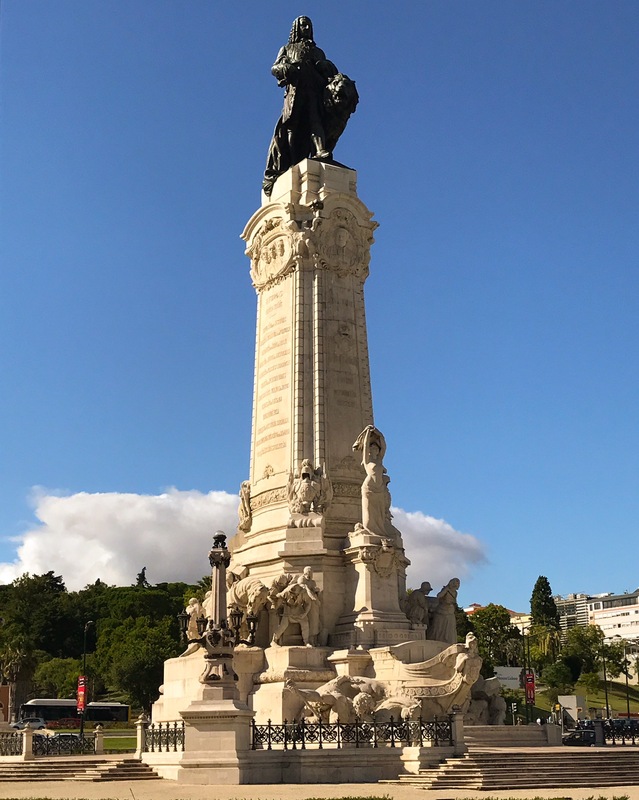 He does know that this is the Praça do Marquês de Pombal and the statue is of a Marquis who was Prime Minister in the 18th century. He also spotted this WWI monument. 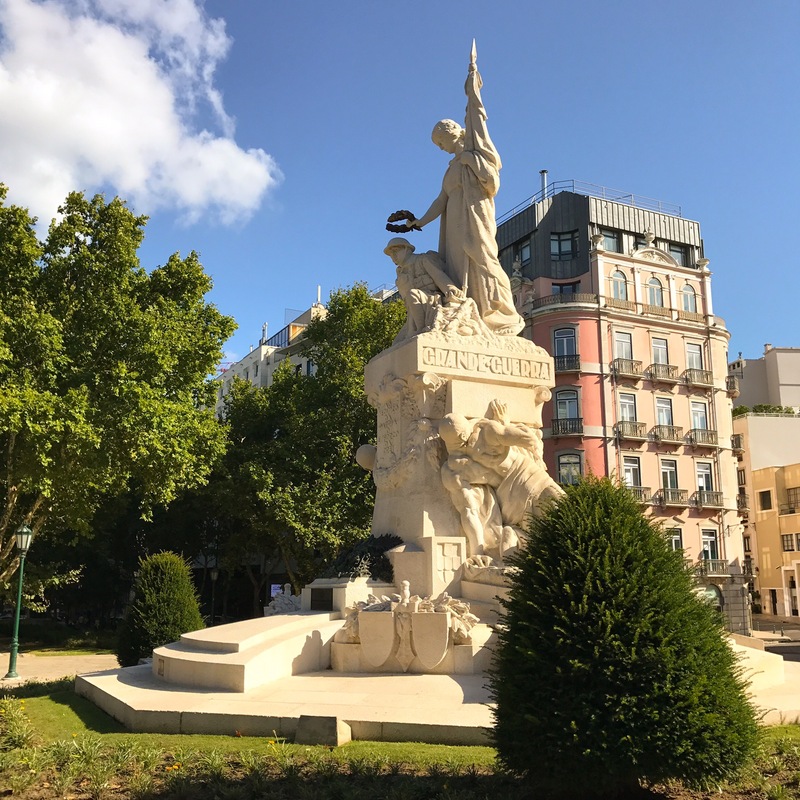 In case you’re wondering, Portugal fought against the Central Powers in The Great War, but remained neutral during WWII. 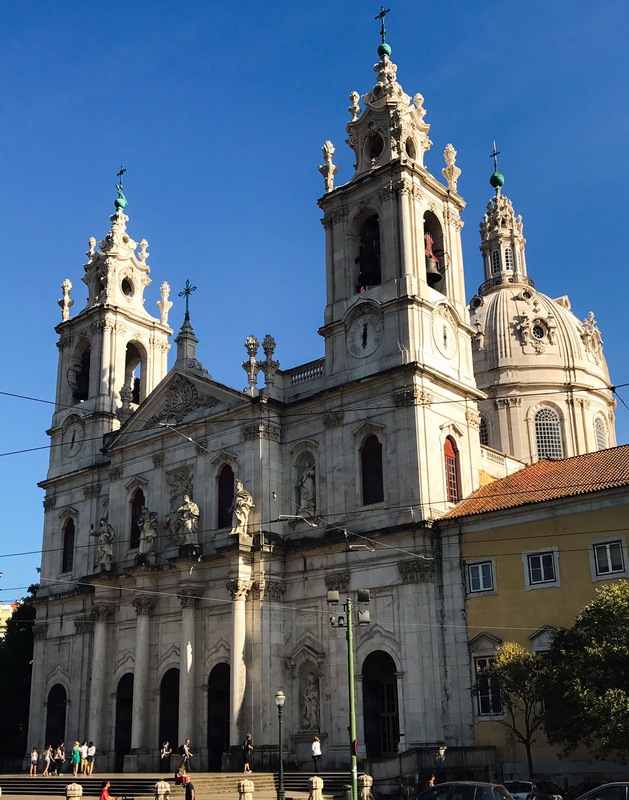 Speaking of neutrality during the war, Lisboa is home to a plethora of churches. 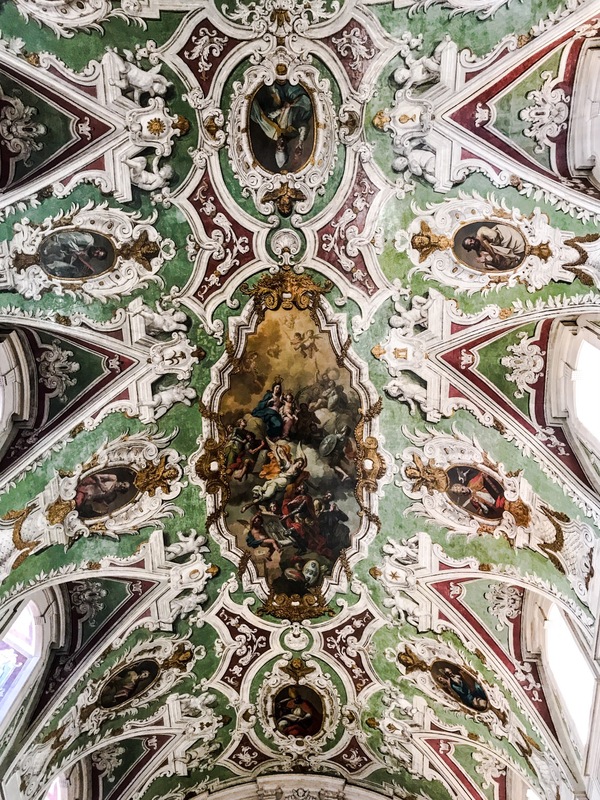 Although many of the exteriors are quite unimpressive, a great number have stunning ceiling frescoes. Also, unlike in Spain, they routinely have live organ music playing during the day. Oh, and this one had a unique feature. Can’t make it to church? You can light an electric candle from home. 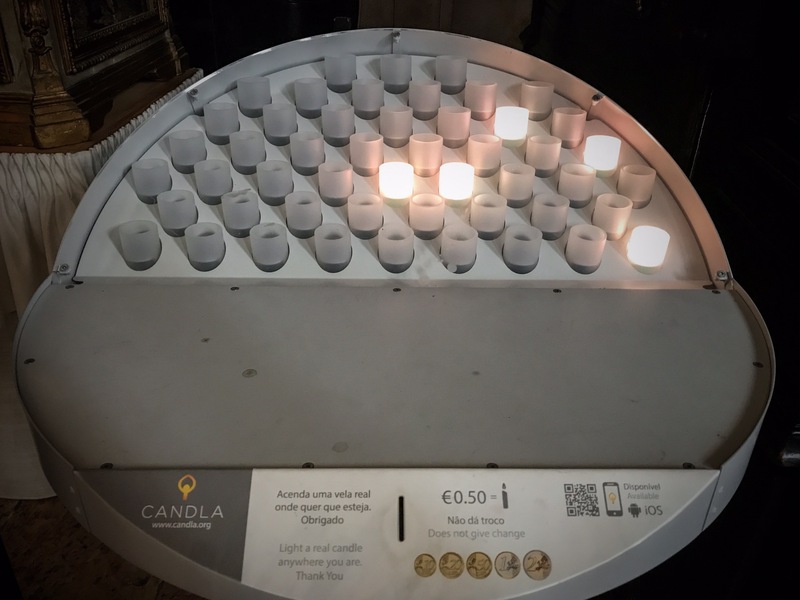 Yes, there’s now an app called Candla where you can pay to have one lit from anywhere! Mikey loves apps – Kindle is one of his favorites. 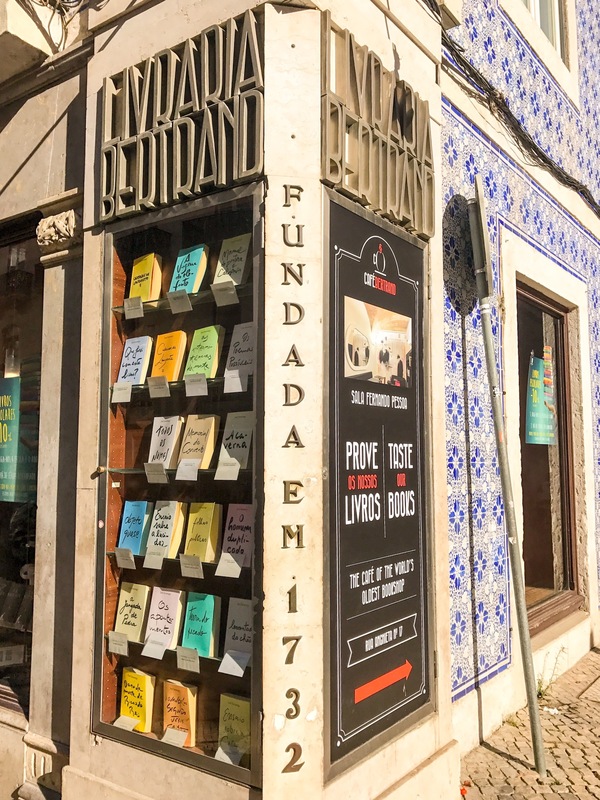 Still, we had to make a stop at the world’s oldest bookstore in continuous operation. Bertrand’s has been around since 1732 and is a major tourist destination. The odd part? Look to the center right of this picture. 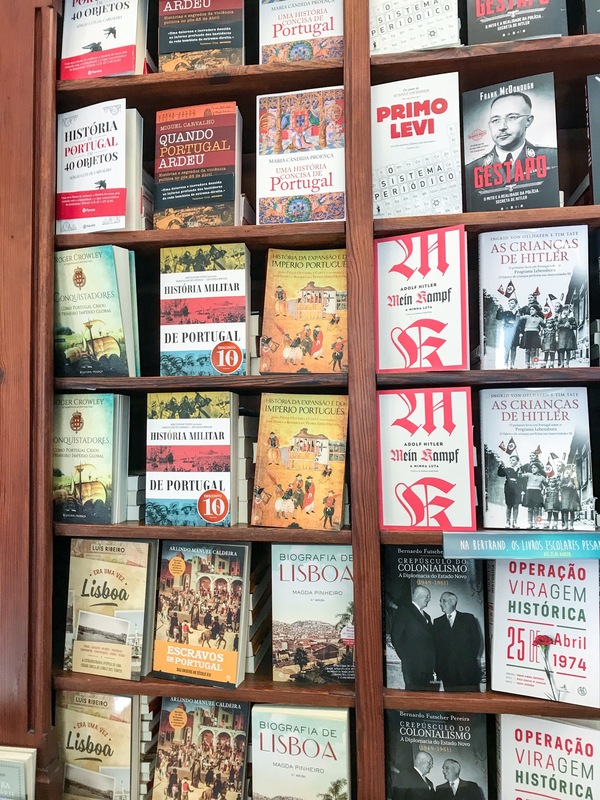 Yes, you too can buy a copy of Hitler’s Mein Kampf in Portuguese with a new introduction. If this has you wondering, we sadly did not have to seek it out. Rather, it was right up front with other bestsellers. 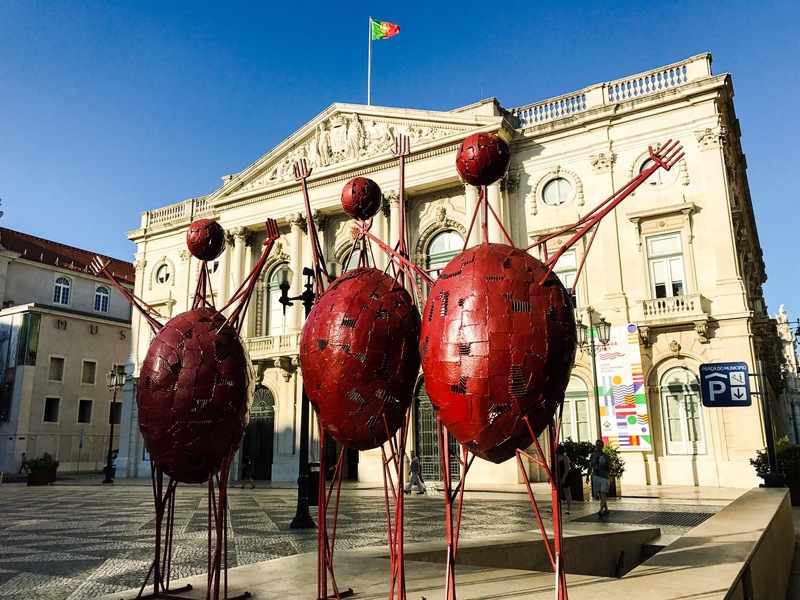 Lisboa is definitely full of surprises. 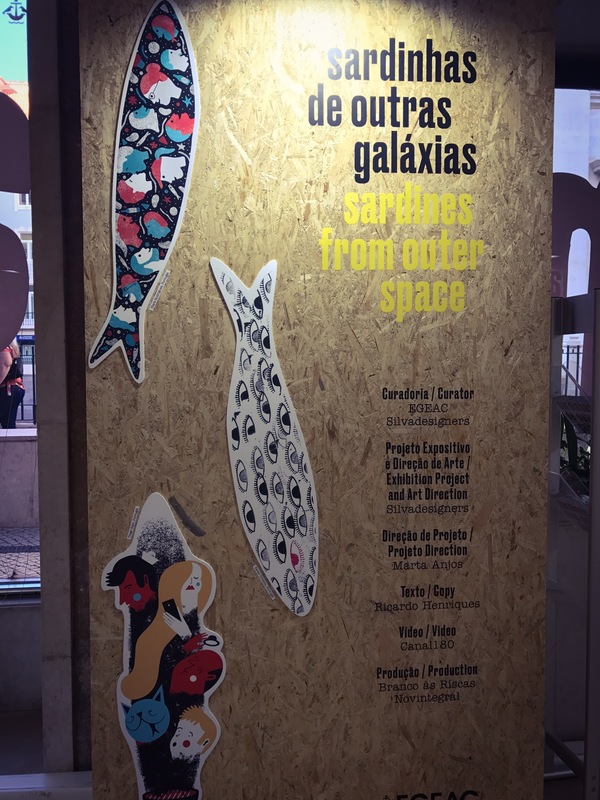 For instance, nearby we encountered this art exhibit entitled “Sardines from Outter Space.” It was basically a popup gallery with decorative sardine cutouts alongside historical quotes. Not sure about this outdoor exhibit either. 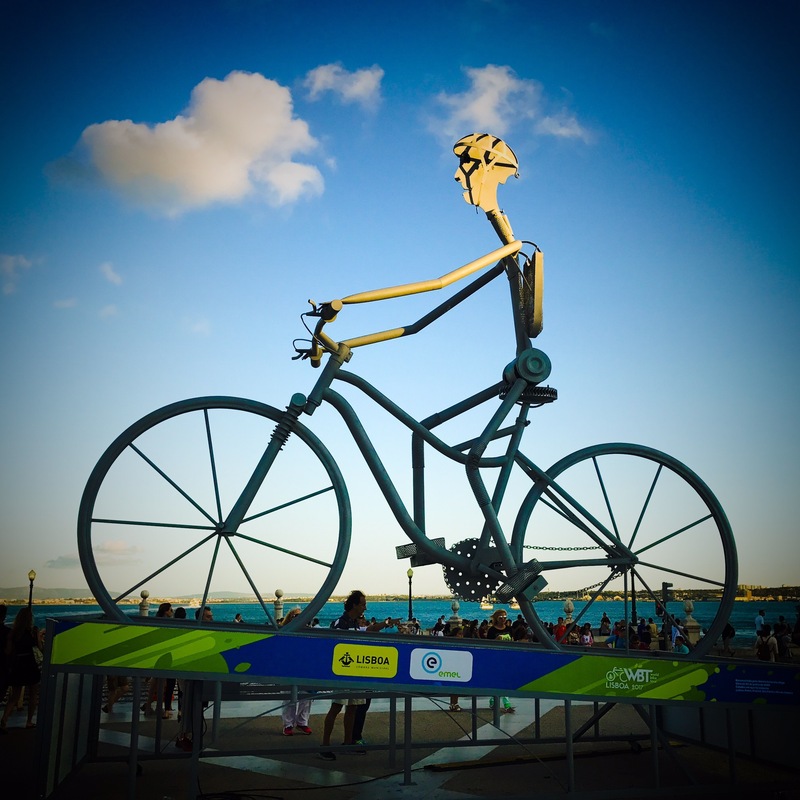 This was a moving statue erected for this weekend’s World Bike Tour Lisboa 2017. It was different and massive. 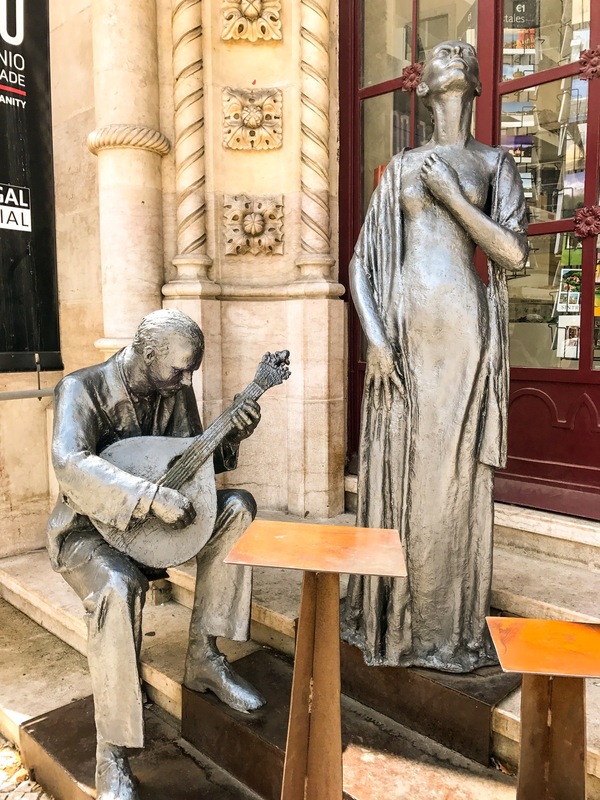 A more original statue was this Fado sculpture in the tourist district. 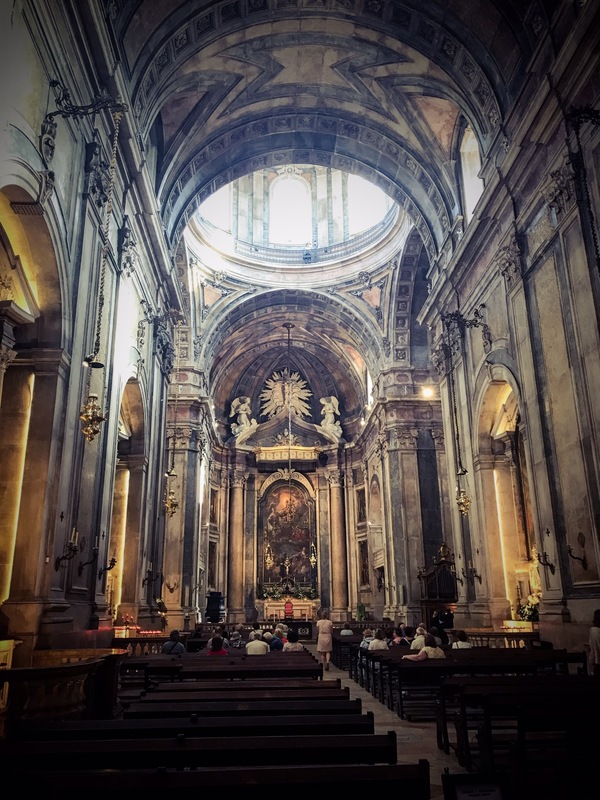 Fado is a Portuguese style of music that is most akin to the American Blues. It formed as a melancholic exchange between fishermen and their romantic attachments left behind onshore. In fact, lyrics are often described as “saudade” or “a deep emotional state of nostalgic or profound melancholic longing for an absent something or someone that one loves. Moreover, it often carries a repressed knowledge that the object of longing might never return.” If you’ve never heard this genre, it is worth checking out some time. And this was just a creepy statue near our guesthouse. 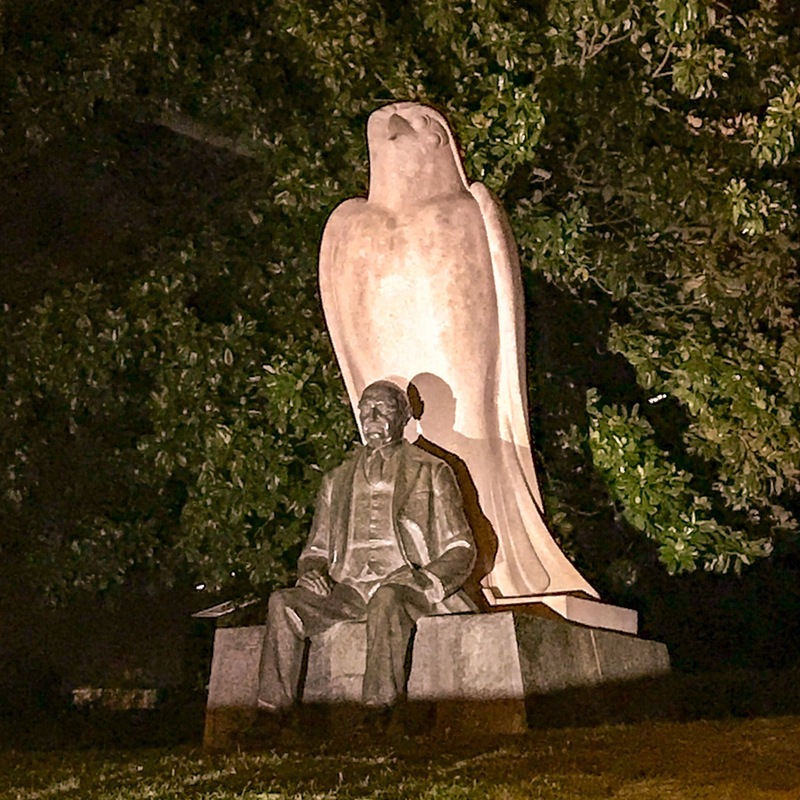 Hitchcock aside, birds are downright scary and giant ones are even worse. 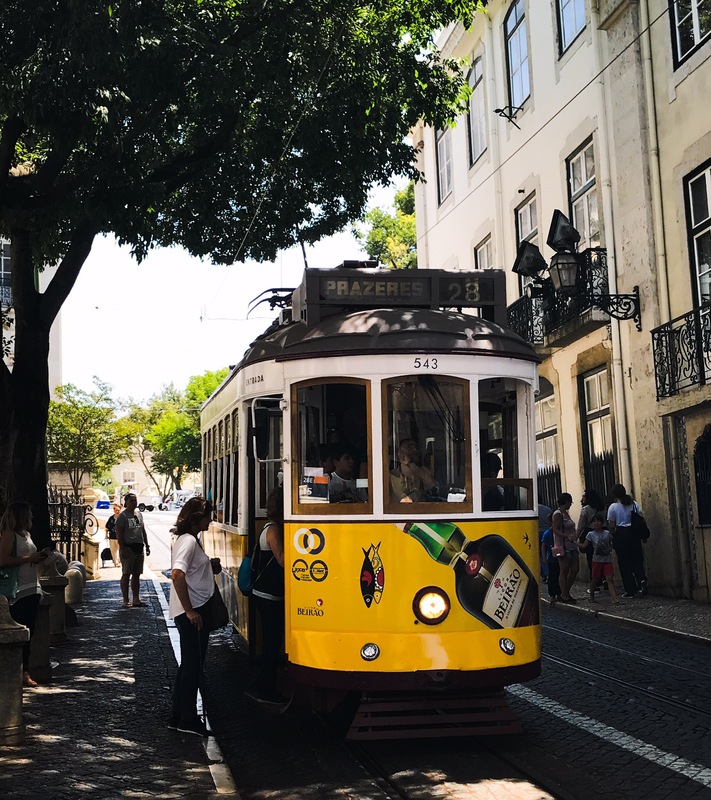 Much like San Francisco, the streets of Lisboa are crowded with rails and electric wires to power a fleet of trolleys. Also present is the Lisboa Golden Gate replica known as the April 25th Bridge which commemorates the 1974 military coup known as the Carnation Revolution. In the far distance you can also see the Christ the King monument that was inspired by Rio’s Christ the Redeemer statue. 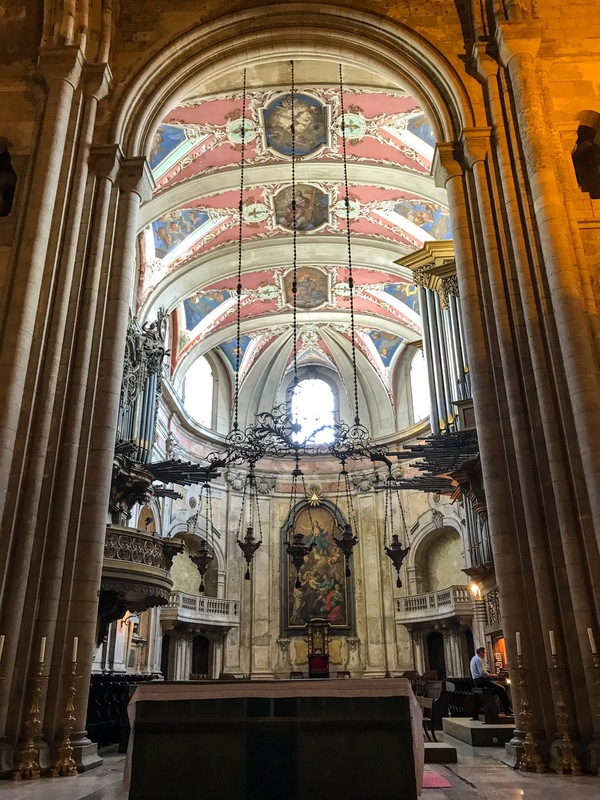 …but, the vaulted interior was really impressive. 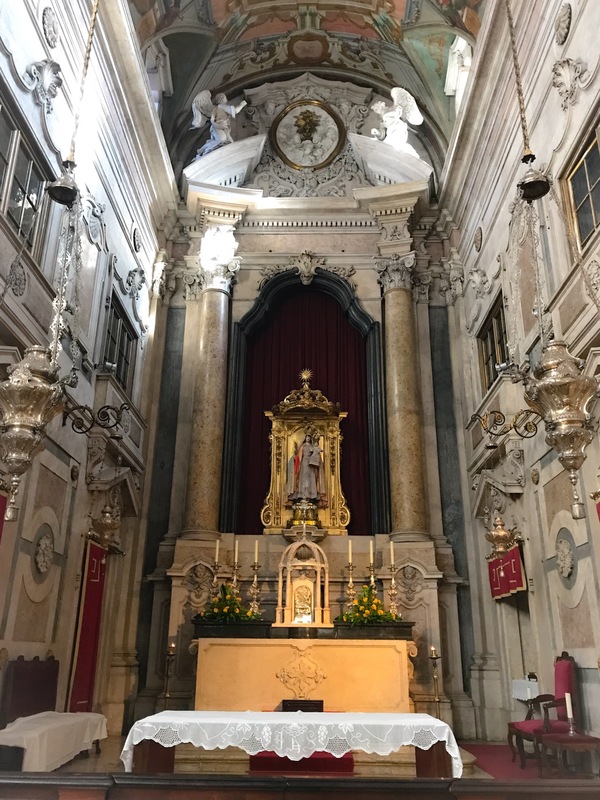 Again, note the beautiful ceiling above the high altar. Mikey had to get a selfie here. 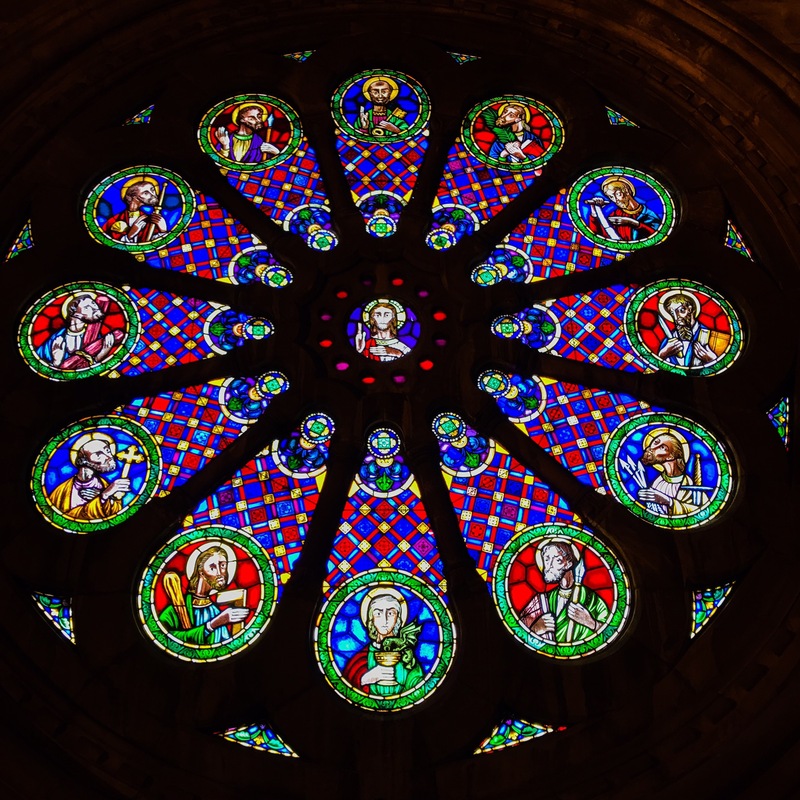 The rose window is especially beautiful and can be reached from the tribune. They also have real candles that you can light for 40 cents. But, they don’t provide change so the Church owes Mikey 10 cents. Mikey really wanted to sit down for a bit in the archbishop’s throne, but couldn’t get any volunteers to fan him. One really interesting part of the Sé is the ongoing excavation below the cloisters. Like in many ancient cities, excavators have discovered layers of different civilizations built on top of each other. So, dig a little and you get Renaissance arches. 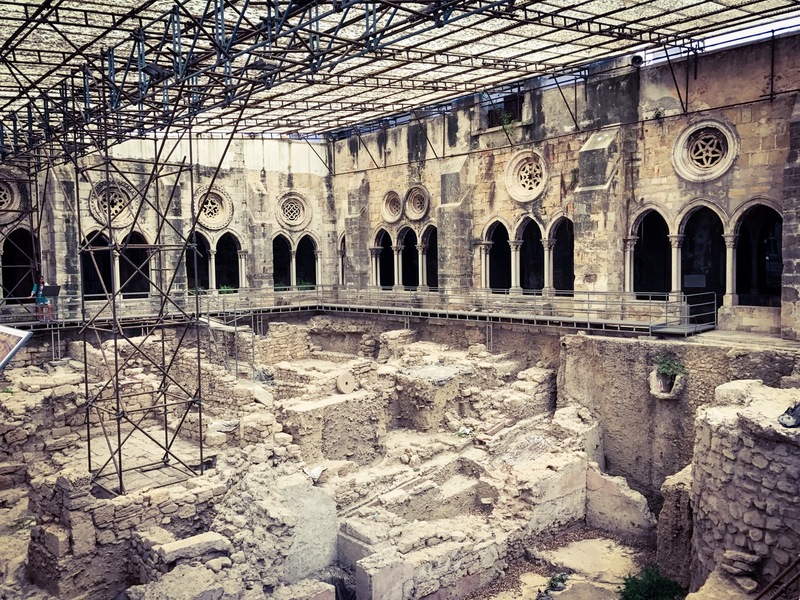 Go deeper and you’ll find an Islamic market that rests on top of a Roman sewer around which are celtic and proto-Iberian artifacts predating Rome! 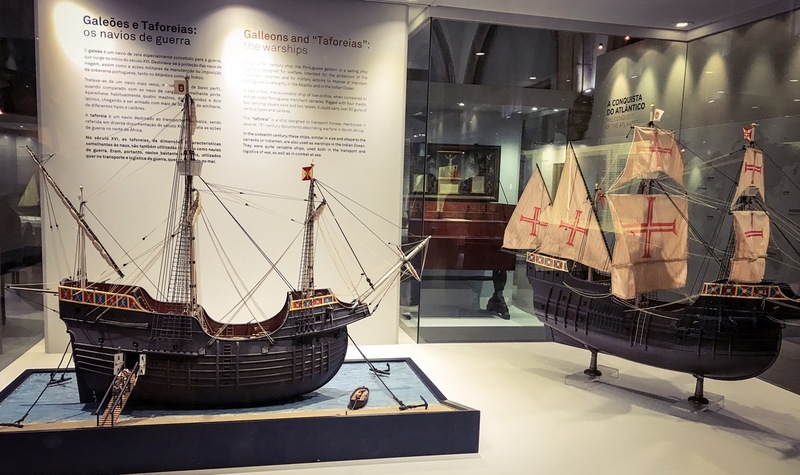 A more modern exhibit details the history of Portuguese navigation. 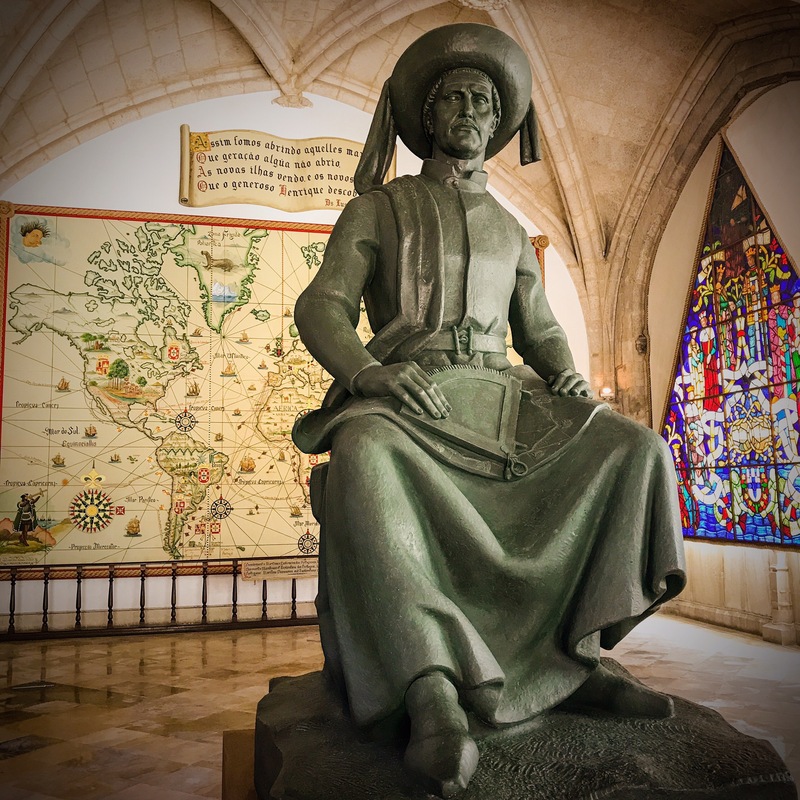 This giant statue of Henry the Navigator greets visitors at the entrance. 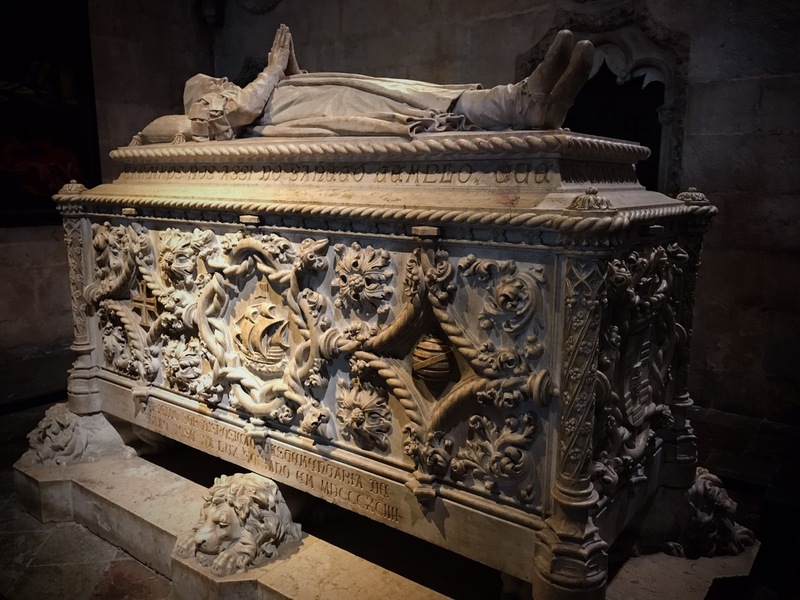 In case you’re wondering, it was Henry who got the ball rolling on European exploration. Columbus, most Spanish navigators, and even Peter the Great of Russia all directly benefited from Henry’s navigation ministry and schools. 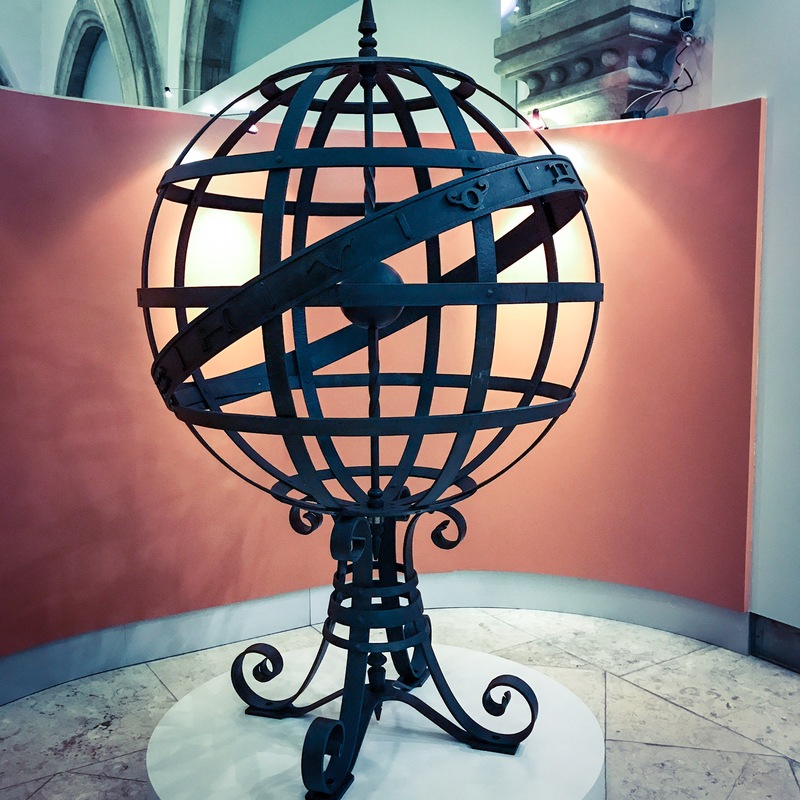 This is a giant Armillary Sphere. It’s basically an instrument dating back to ancient times which is used to calculate the relation of the earth to the cosmos for navigation purposes. 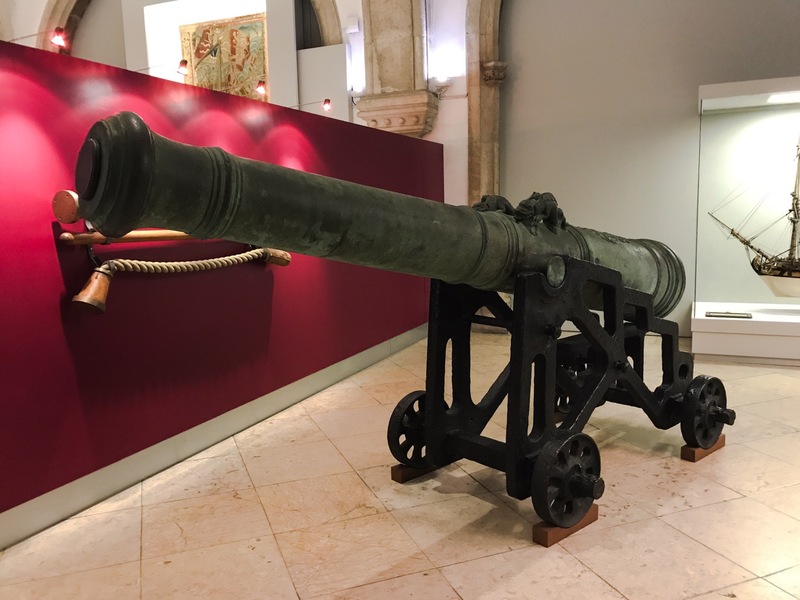 Of course, there was the weapon tech exhibit, too. Mikey thought it was pretty interesting to see cartographers’ ideas of what the world looked like over time. This particular map was from 1505 and shows just how limited the combined wisdom of the ages really was. 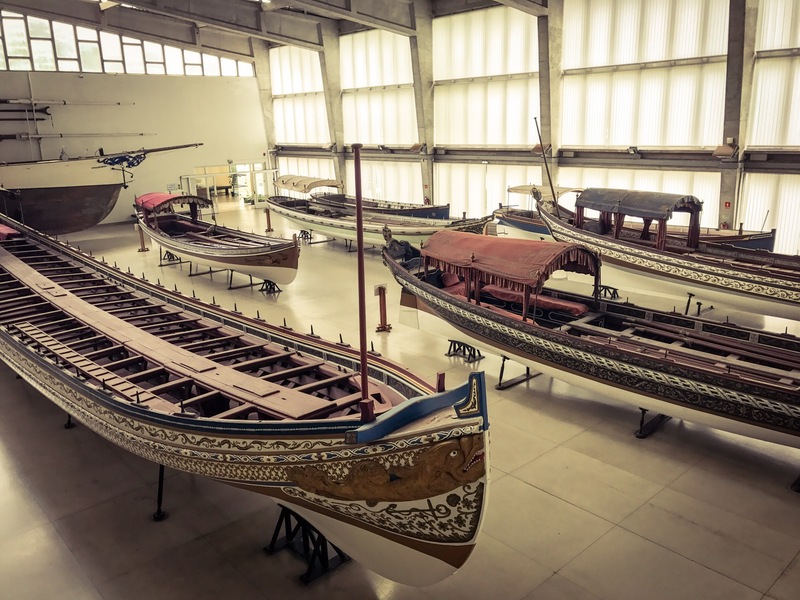 Oh, another neat tidbit about the National Maritime Museum? 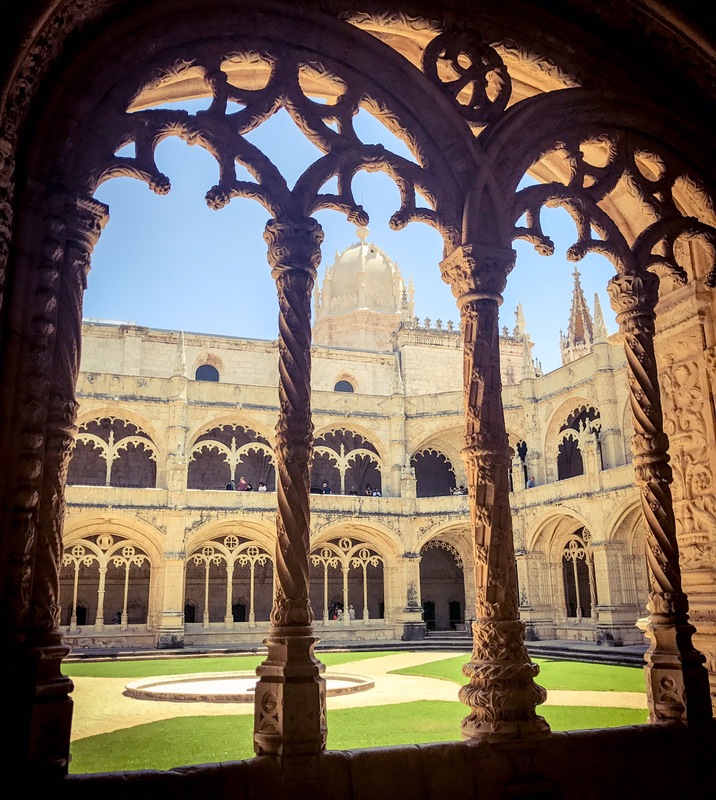 It’s housed in the 15th century Jerónimos Monastery. 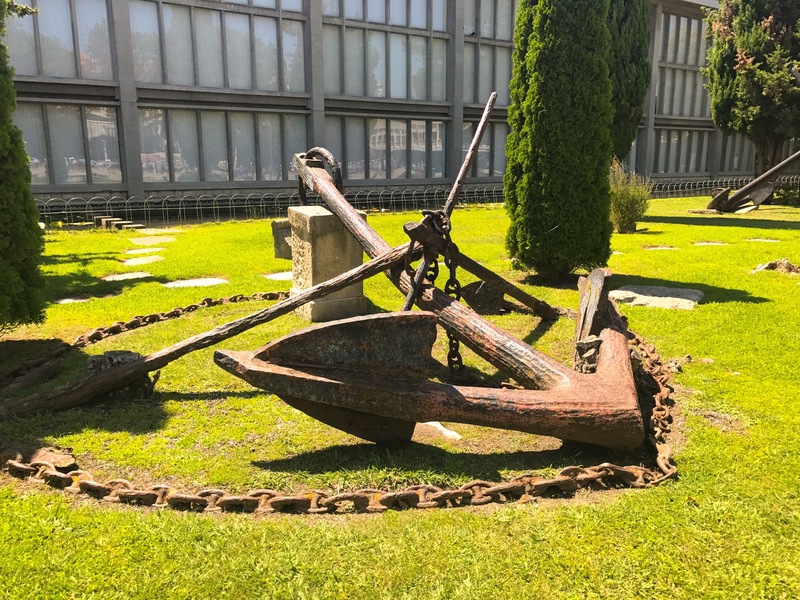 And since it’s administrated by the Navy, they’ve got lots of cool stuff like this old anchor everywhere on the grounds. 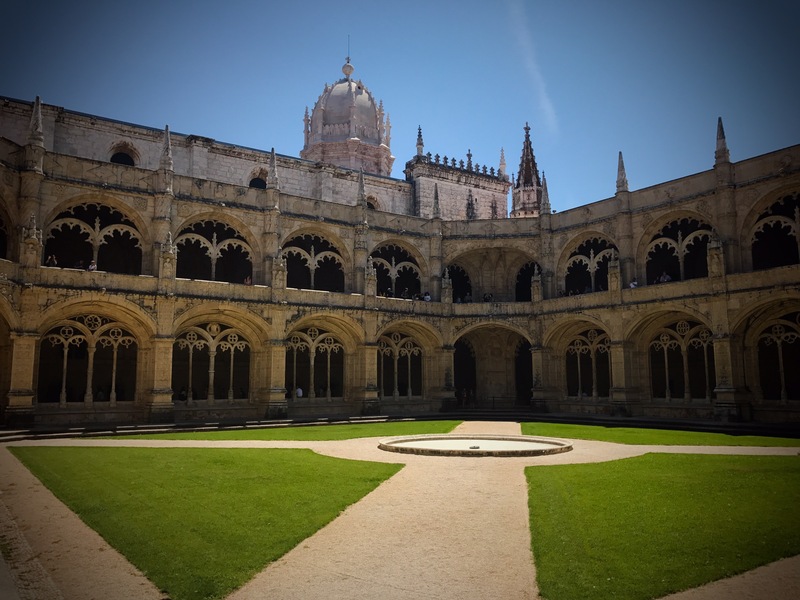 The Jerónimos Monastery was consecrated in the early 1500’s and is one of the best preserved in Iberia. The main chirch was pretty impressive. Still, the cloisters are hands-down some of the most beautiful from this era. Not only are they massive, it was such a beautiful day to photograph them! 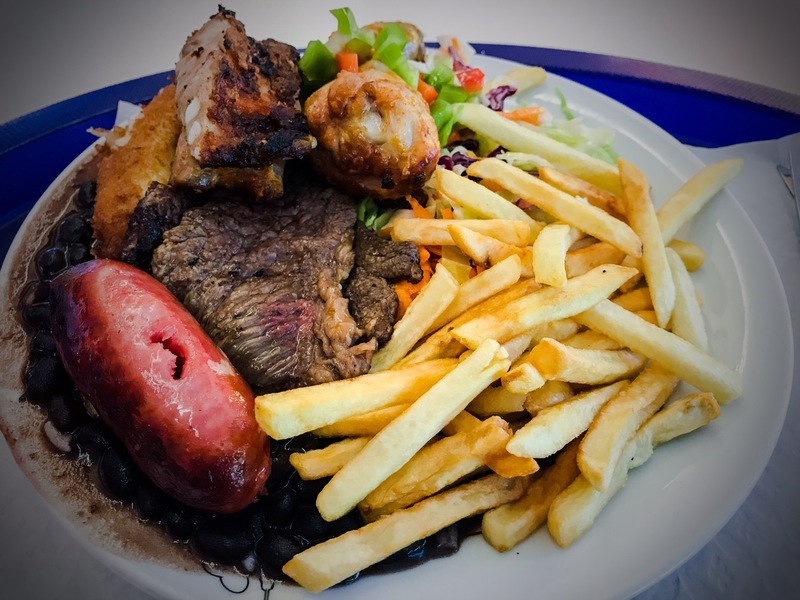 One benefit of exploration and the South American connection is Brazilian BBQ! This plate had beef, chicken, ribs, and sausage with fries, beans, rice, slaw, and a fried banana for 5€. 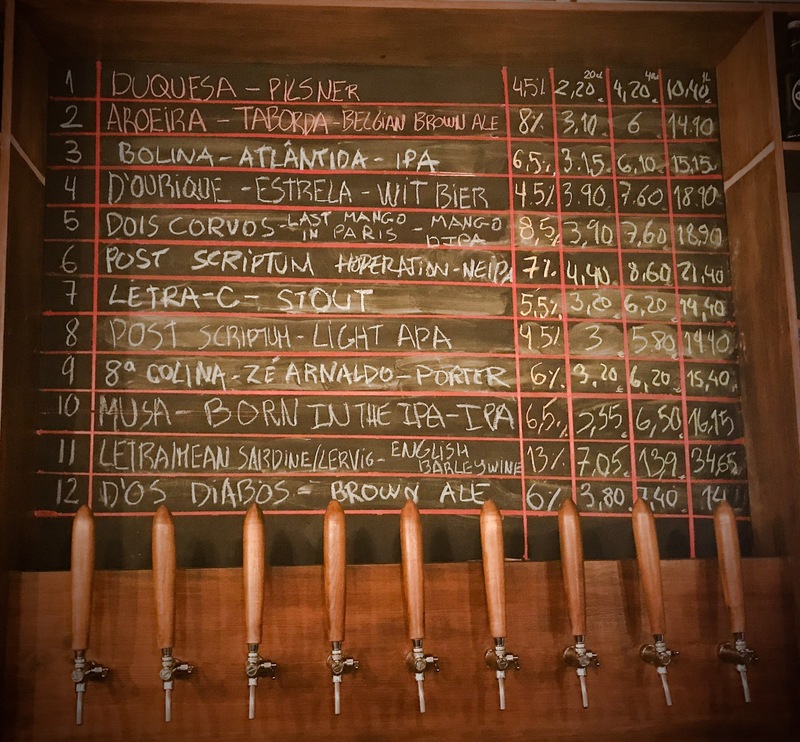 The craft beer scene is also present, but a bit less intriguing than in Porto. 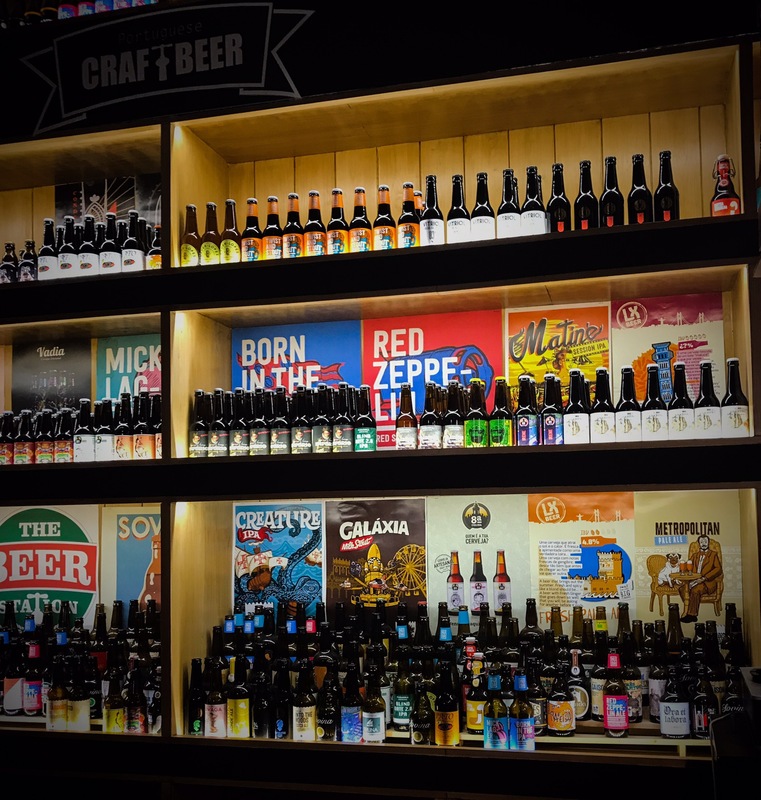 Mostly, it is more bottle forward with lots of imported beers. OK, but not as interesting. 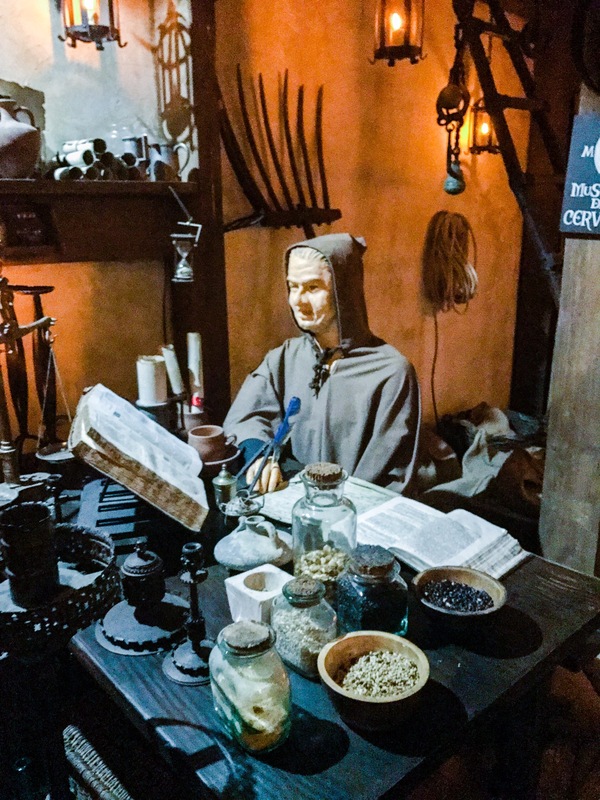 Mikey did visit the Museum of Beer where they had this creepy tableau of a monk in his brewing cellar. The coffee has been a bit disappointing, however. 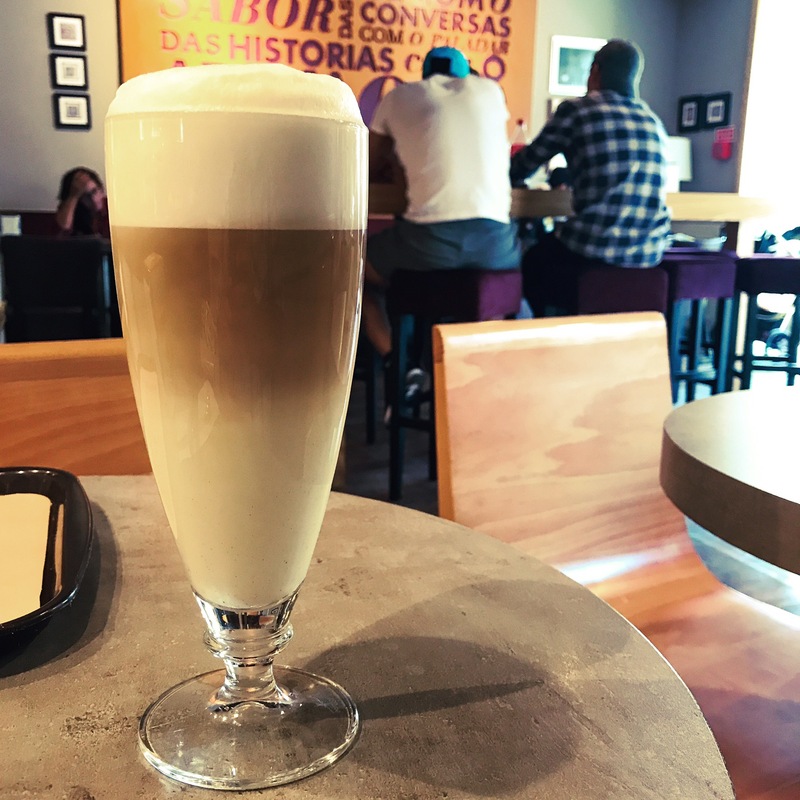 We ordered a latte and were served this milky monstrosity with very little espresso. It wasn’t gross – just more of a coffee flavored milkshake. We tried a cappuccino later, but it was practically served in a soup bowl. 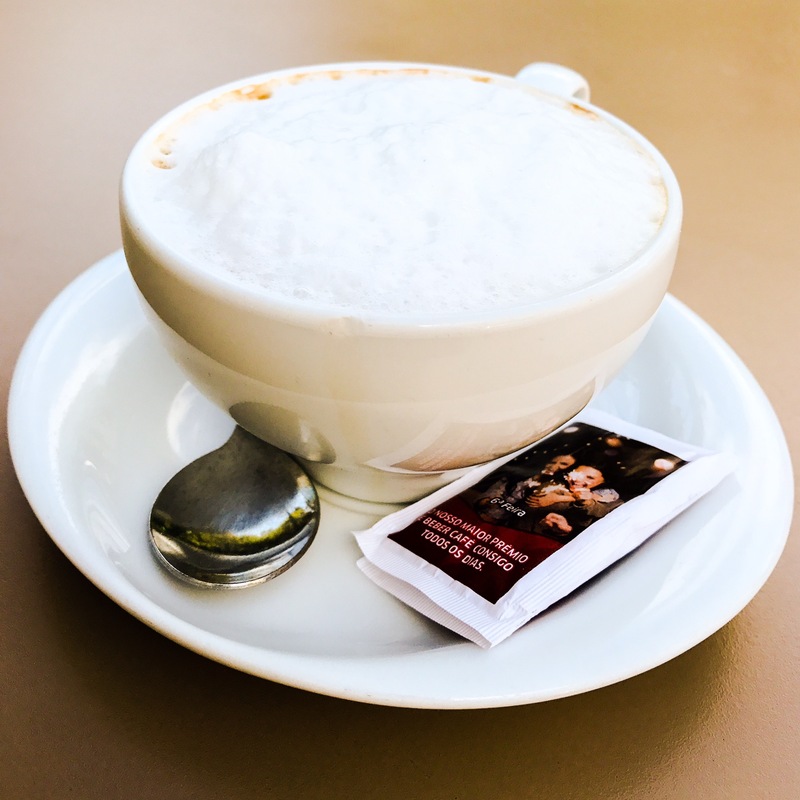 Can’t wait to get back to Spain where the coffee is done correctly. 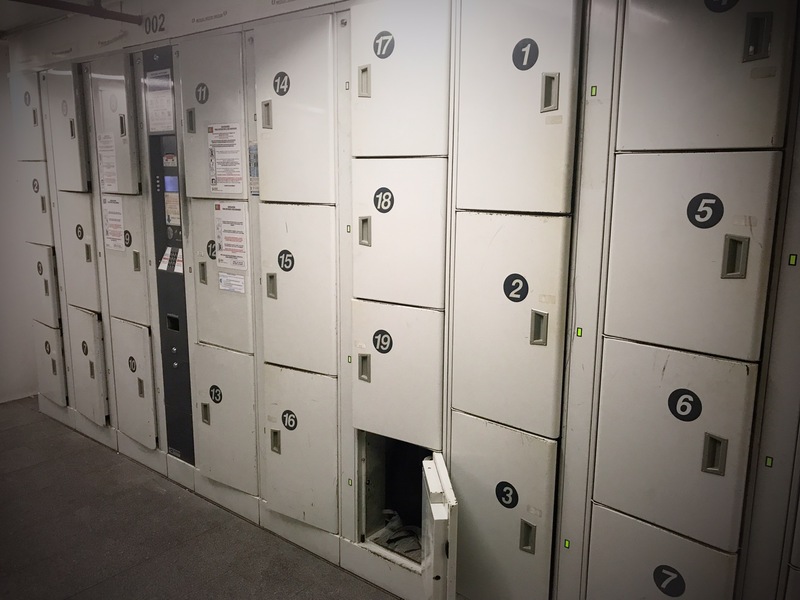 After doing laundry and checking out of the guesthouse, we put our backpack in a locker at the train station (yes, this was a leap of faith!) and went for some last sightseeing. 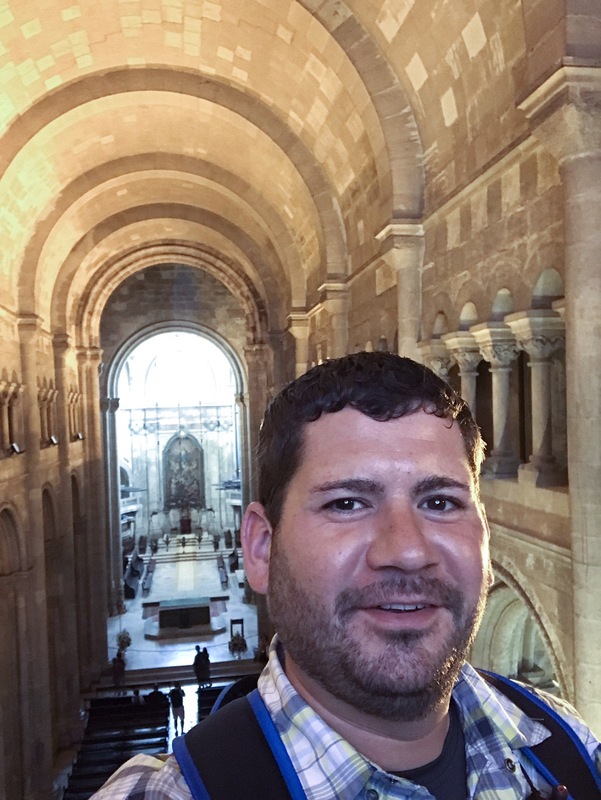 The Basilica was a very impressive church. 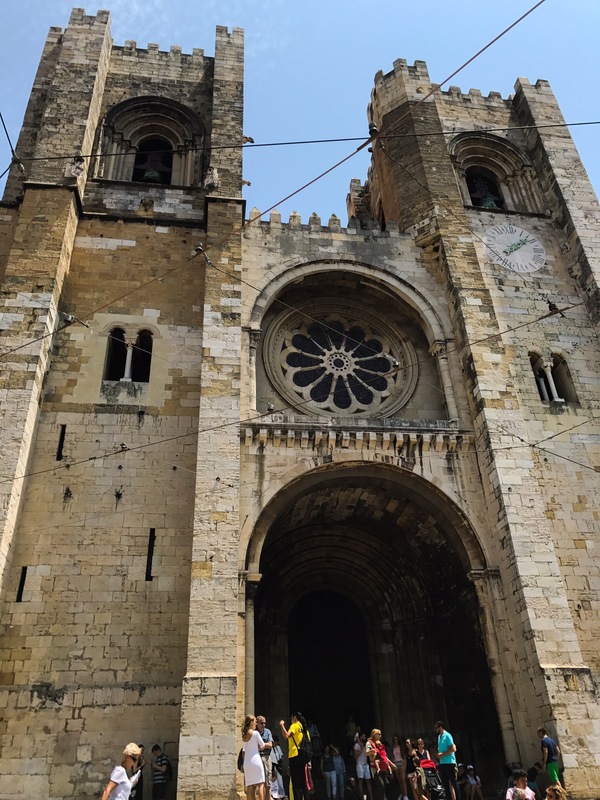 Unlike many other Lisbon churches, it was isolated enough to be able to appreciate the exterior. 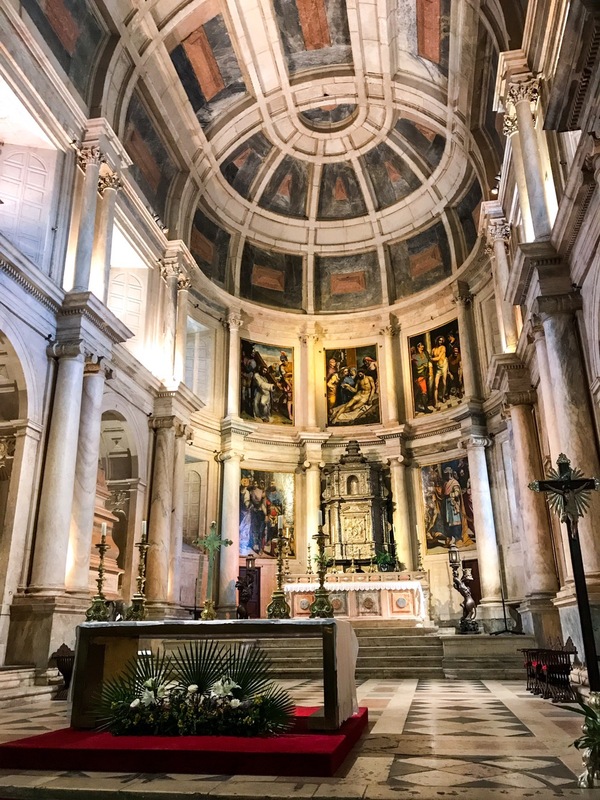 The interior espoused the regular vaulted ceilings and beautiful frescoes. ​But, this time we got live music from some lady who was practicing for Sunday. 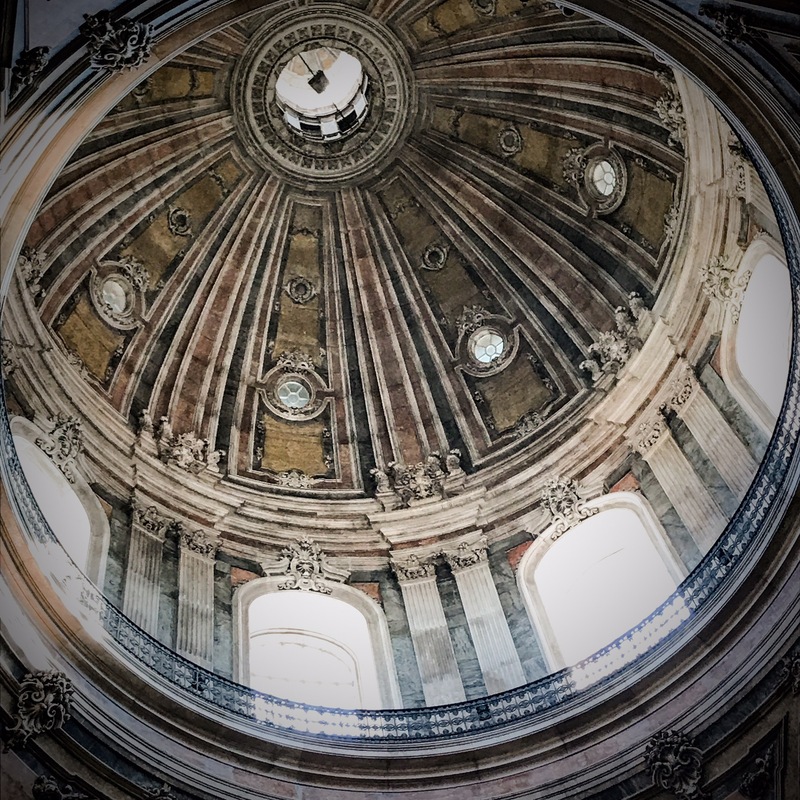 This is a view of the main dome. After a last tasting and mailing postcards, we headed to the train station. 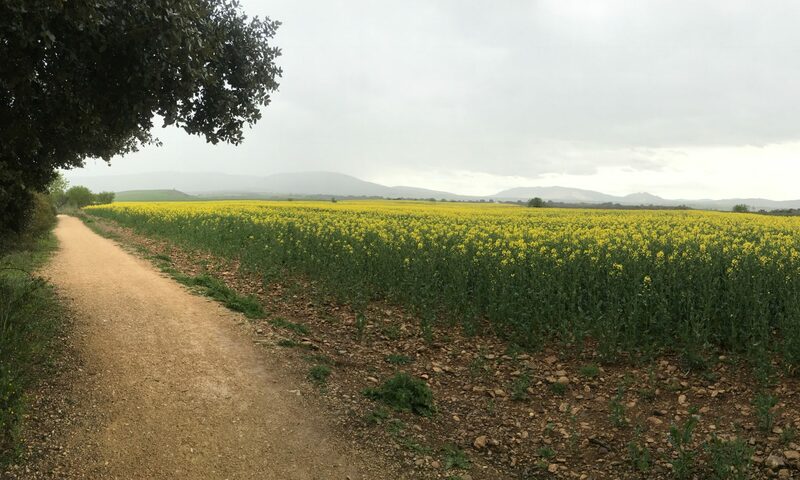 Alng the way, there was anintramural scouting group who were enroute to start the Camino de Santiago! We got to the train station with plenty of time to snap a picture of the exterior. 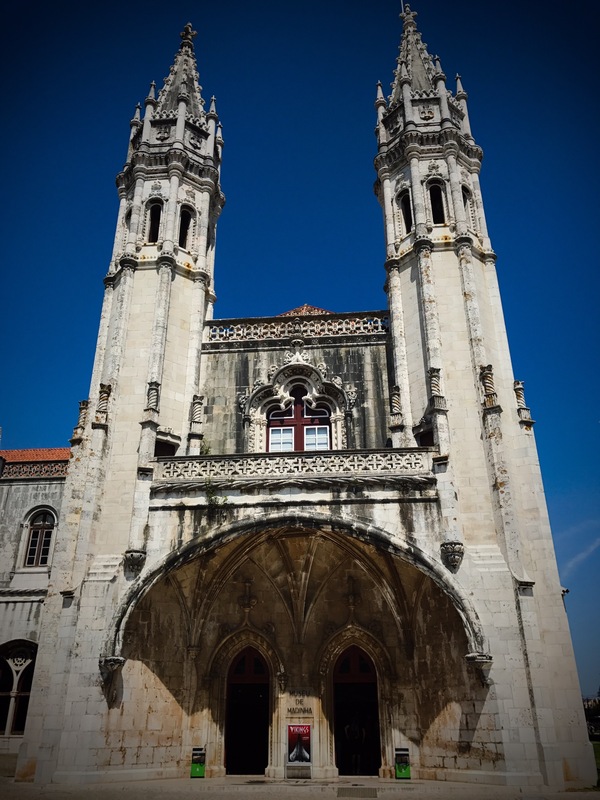 Lisboa has been a whirlwind of fun and it was nice to exit from where we began. 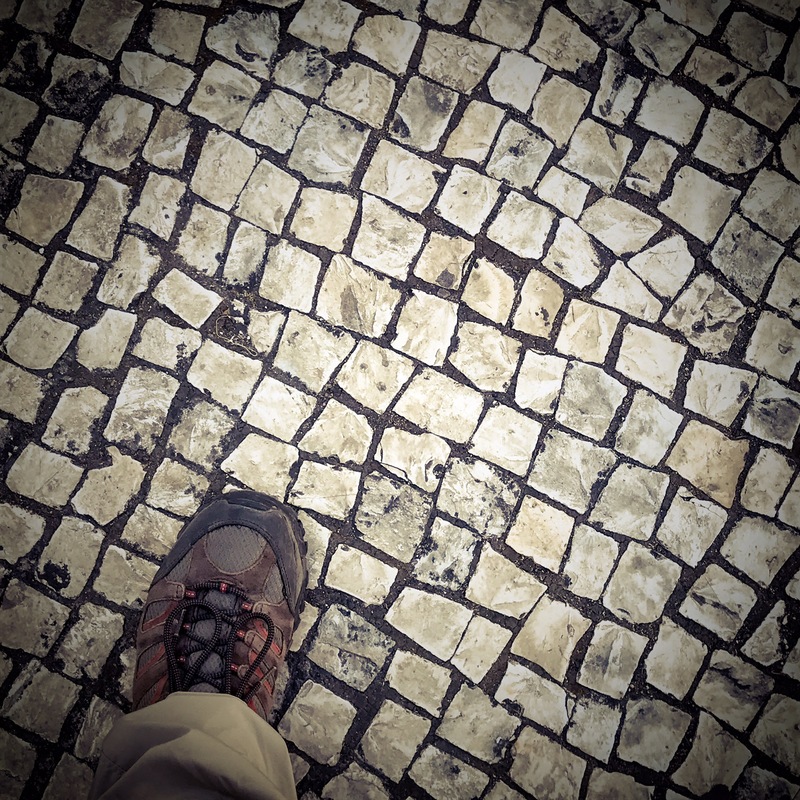 Mikey’s last steps on Portuguese soil – er, pavement. 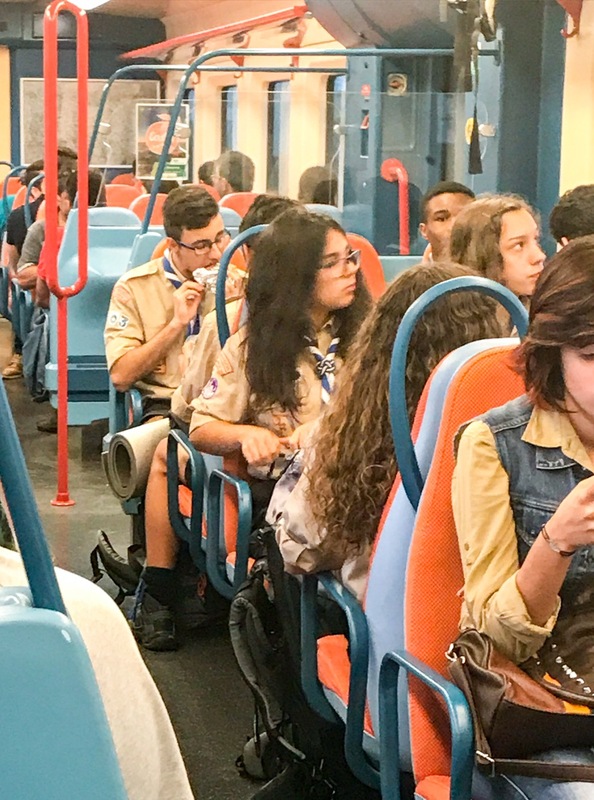 Well, we’ve got an overnight train to and then a few days in Madrid. We’ll have to chat soon from Spain 🇪🇸! Hasta entonces.